B2B and B2C Enterprise Companies trust Infoverity and Informatica’s best-of-breed MDM and Product 360 solutions, to master and deliver high quality data about their Customers, Products and Suppliers across all functional areas of their business. In the business, the full realization of value of a company’s MDM investment is often dependent upon the delivery of the data in context – to drive a rich, personalized eCommerce experience. Infoverity has partnered with Adobe, the unmatched leader in digital experience, to deliver the ‘last mile’ of information content to drive fluid, customer experience across web channels. 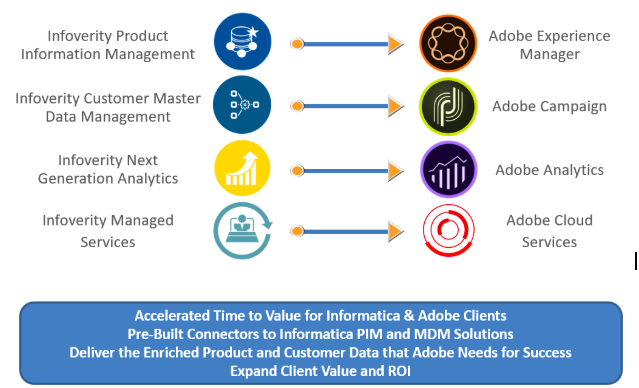 Business drivers and expected value realization for Adobe solutions are dependent upon assumptions that the data will be there, and be fit-for-use to drive presentation of the content and deliver fluid experiences to customers. Infoverity ensures these data dependencies are met. MDM as the Bedrock – Companies require mastered product and customer information to deliver on eCommerce, Marketing and Sales goals. Data Disruption – Companies often experience complications with consolidation and the delivery of high-value product and customer data, which often limits their ability to fully unlock the value from their Adobe Experience and eCommerce investments. Key Takeaway: Customers require clean, enriched information about their products and customers to enable the business, and the ability to deliver and present that content to drive an unparalleled customer experience. When such a strategic and often complex endeavor is undertaken by an inexperienced project team, the risk of failure is high. Infoverity and Informatica clients are in need of end-to-end business solutions that enable strategic business drivers – coupling Informatica and Adobe technology, along with Infoverity’s world-class consulting and solutions, will provide maximum business value to our customers. 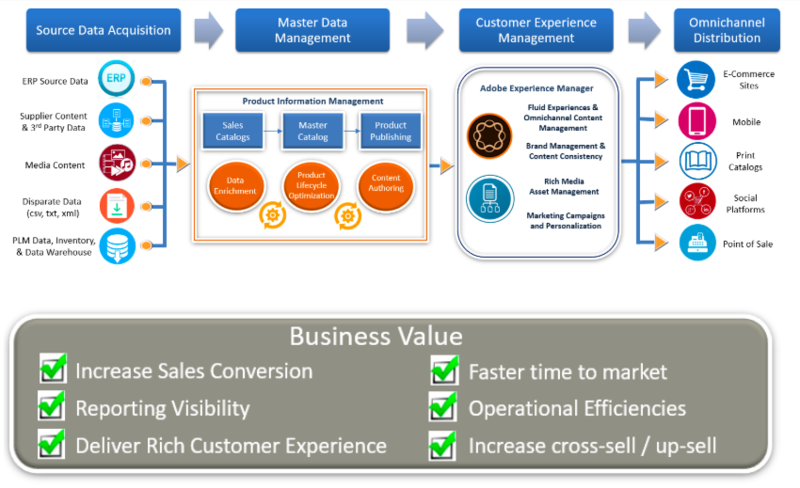 Infoverity has pre-built connectors from Informatica MDM & Product 360 to the Adobe Experience Cloud to create seamless omnichannel delivery of mastered data to drive customer experience. A large equipment manufacturing customer, and a large construction material manufacturing customer, each undergoing a new branding initiative and a ecommerce website redesign, were looking at how their customers interact with their products. Each one purchased Adobe Experience Manager to create and perfect the shopping experience for their respective customers. Because Adobe requires high quality data from a Master Data management (MDM) system and a Product Information Management (PIM) system, Infoverity was hired to implement Informatica Product 360 to master their product data, and built a connector to feed the product data from the Informatica Product 360 platform into Adobe Experience Manager. High quality content was then delivered to the customer-facing website, improving the overall interactive shopping experience. For more information, contact: Steve Ruff, Director of Infoverity’s Product Solutions Group, sruff@infoverity.com or Adam Sigg, Director of Infoverity’s Customer Solutions Group asigg@infoverity.com, or visit infoverity.com/contact.